Finishing off the year with some more big-name titles. Absolutely essential for beat 'em up fans! Nintendo of Japan just never seems to stop being awesome - They've got another eight VC games planned for release in December, with the large likelihood of Namco Bandai also having some yet to be announced titles in store. Part of the lineup are another Japan-exclusive, Nintendo-developed NES game, the SNES's best beat 'em up, and another great Neo Geo fighter. Let's hope Nintendo of America and Europe have at least equally large plans for the month! Detective Club, Final Fight, Metal Gear and KING OF FIGHTERS? I want a Japanese Wii. Zaxxon? Excellent! Now I Sega will get the Star Trek license to release the Tactical Command Simulator I will be extremely happy; I'll settle for Astro Blaster, Tac Scan (hopefully with twist/pointer for the dial) and Space Fury, though. And Rompers I can wait for; as it's one of my very favourite Namco games I really hope it's coming next week! final fight 3 is good. 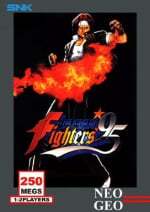 KING OF FIGHTERS 95. Excellent game. The first really good KOF game that is still liked today. Almost the super turbo of king of fighters for the time. I would so get that if it came out 60hz but nintendo wont get a sale becuase they will release it 50hz as its never been played before. On saturn it was at least sped up. If they release it that way I will stick with playing it on finalburn alpha on xbox. Cool more fighting games. KOF 95 is good because you can finally start mixing and matching fighters for your team(although its under a short timer). We might see Final Fight 3 before Christmas. That's if it doesn't interfere with NoE's 1 VC title every week policy. Would love Famicom Tantei Club Part II: Ushiro ni Tatsu Shoujo Zenkouhen and Metal Gear. No Smash Bros.? DARN YOU NINTENDO OF JAPAN!!! King of Fighters 95 huh? Interesting, keep the Neo Geo support coming! I definitely want Final Fight 3! I hope that we get it soon! why isn't kof '95 in na yet? Final Fight 3, huh? I've yet to play Final Fight 2, but, this looks promising. Sega's bringing pre '85 arcade games? Oh joy, this means Flicky, on of my favorite Sega arcade games, could be on it's way! Oh well, I think this will still be a great week. KOF 95?! Awesome! I hope it comes to america soon! KoF '95 is cool and long overdue, but still, you can get all the KoF games in The King of Fighters Collection for the Wii. I'm more anxious to get my hands on Final Fighter 3, which isn't available on any collection. Now hopefully once Capcom is done with FF, they'll start releasing more Mega Man games on VC. While I also consider Final Fight 3 to best the best of the ones I have played (which does not include Revenge or Streetwise), ta gotta realize that it's still a matter of opinion. There's still NES Mighty Final Fight and arcade Final Fight. 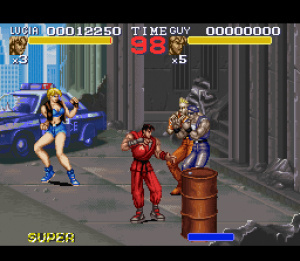 This doesn't happen on the Virtual Console but they should give away Final Fight Guy to those who have downloaded the original SNES Final Fight. Mighty Final Fight is fun. And I liked Streetwise. I am just glad more Neo Geo games are going to be released. I like FF3. I hope FF I comes to VCA in America. Oh sure, an 85 MB game can come to the VC... Yeah right. I'm pretty sure the arcade version of FF1 is on one of those Capcom Classics Collection disks for PS2 and Xbox. From what I hear though, the SegaCD version is virtually arcade perfect. Looks like another good day for Japan. I hope SNK continues its support on VC in Japan and abroad - the sooner they release Pulstar, Last Resort, Ironclad, and KOF'99, the better!